Tried everything to get rid of blackheads? Effective blackhead removal is hard due to how stubborn these little plugs are – but it isn’t impossible. This page has everything you need to know about how to get rid of blackheads. The first step in knowing exactly how to get rid of blackheads is knowing what they are and what causes them. This gives you the power! Because they can be mysterious little things. Why do they never seem to go away?! It is as if the pore just refills automatically! A “plug” in a skin pore. Because this plug is in contact with the outside air it oxidizes and turns a blackish color. Kinda gross. They are most common on the T Zone but also the cheeks. You might also get them in your ears or on your back. Why do blackheads form on your skin? They are a passive ‘tag along’ as far as your body is concerned, so it doesn’t do anything to keep them under control. Your body doesn’t even notice they’re there! 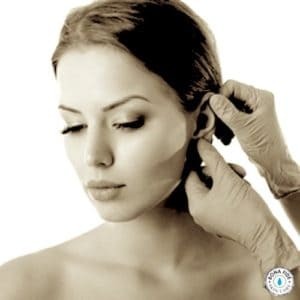 Because blackheads are just a plug in an open pore and aren’t seen as a threat by our bodies – it becomes obvious why they never seem to go away. This fact is really important to keep in mind – and why the right blackhead treatment is so vital. Squeezing a blackhead is like an invitation for it to fill up again. Getting rid of blackheads requires a different approach. A squeeze may work temporarily but it’s like trying to dig a hole in wet sand – the water (oil) and sand (dead skin cells) are still there. Squeezing blackheads is like digging a hole in wet sand. Frustrating, tiresome, and useless! To keep that hole clear, we need to keep the sand and water away from it (end of analogy!). Consistently keep the pores clear from oil and dead skin cells by using a good glycolic acid product. This also helps the pore ‘refine’, as it clears it can go back to its normal size. By keeping pores clear you can reduce their appearance as they “shrink” back (see more on how to minimize pores here). So How Do You Actually Achieve This? By using glycolic acid – this dissolves the “glue” that holds dead skin cells together on the surface of your skin. Glycolic acid (AHA) unblocks pores and helps skin to remain clear. The best product to use is one which is not diluted with a lot of other ingredients. – Even a high percentage of glycolic acid is useless in (for example) a moisturizer with a whole bunch of emollients or other ingredients. Look for pure glycolic acid – so it can actually do what it should. Check out customer reviews and details about our Glycolic Daily Exfoliator 7.5% here. It is the easy way to get the best results from this powerful AHA. After cleansing at night, apply the exfoliator to dry skin using a cotton pad (like a toner). Concentrate on oily/congested, blackhead prone areas. Depending on tolerance leave it on skin for up to 1 minute. For the first week or two this may only be a few seconds until your skin gets used to it. Rinse with cool water, and apply a moisturizer. IMPORTANT: make sure the moisturizer is light and oil free. The wrong will simply cause the blackheads to come right back! You can layer this product on congested areas – apply one layer, wait a few seconds, then apply another on top. This can increase dryness but is very effective at clearing skin. This is the only exfoliation treatment your skin needs. 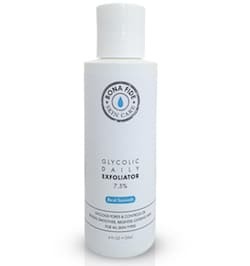 Our Glycolic Acid Daily Exfoliator 7.5% has a high percentage that is powerful enough to greatly improve skin (some skins will feel it working) but gentle enough to easily use on a regular basis. The Next Step for How to Remove Blackheads – sometimes you just gotta squeeze! Sometimes after using your glycolic acid product you will notice the blackheads look “looser”. This is actually a good time to squeeze! 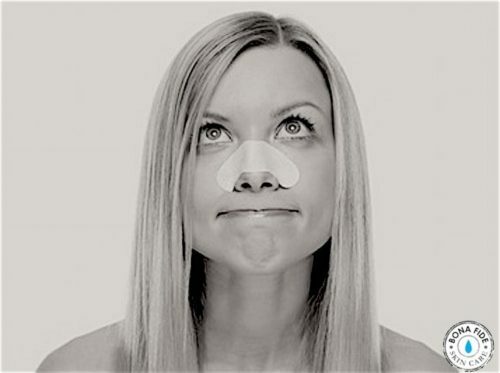 Proper blackhead squeezing is a way to clear those pores and help move the process along. Especially those extra stubborn ones that need a bit of help…. But it is really important to only squeeze the right ways and do so properly. For nose blackheads, a blackhead extractor tool is a must, as it is so hard to squeeze those side crevices! Afterwards make sure to splash with cool water, clean the tool, and apply a clay mask to help soothe and refine pores. Consistent use of glycolic acid to dissolve and loosen blackheads – combined with a squeeze when necessary – is the best way to get rid of blackheads. Be sure to see the quick blackhead tips at the bottom of this page for more! Use a clay mask with zinc to absorb oil, reduce pore size, and rebalance skin. A very thin layer of clay mask on the nose before applying concealer (should be barely noticeable) in the morning can help smooth out pores and treat them all day! Remember – good skin care doesn’t work overnight. At least 7 days may be needed to start noticing a difference. If you follow the steps on this page, expect to start seeing a bigger, noticeable difference in about 4 weeks. Blackhead prevention is one of the most important steps in maintaining clear skin. Turning off the ‘automatic refill’ is our aim! This is the most important and most successful step, and is fairly easy to achieve. Think of it like your kitchen bench – if you don’t give it a quick wipe clean everyday it will build up grime. Cleansing with oil works really well to dissolve the hardened blackhead plugs, which then helps to ‘release’ them. This also gives your glycolic acid/AHA exfoliator a head start. Sometimes they just come out by massaging a warm wash cloth over your skin after. Try it! Blackheads really require more power than most home remedies can provide. However, some can be helpful – so here are the best of the best! Milk of Magnesia is a great way to control excess oil, which can help keep blackheads at bay. Apply a very thin layer in the morning and leave it on. This works better than most (expensive) mattifying primers! Baking soda blackhead removal mask: mix a small amount of lemon juice and baking soda to form a paste. Apply to congested area only (this is strong) and leave on for 10minutes. Remove with warm water. This can work to dissolve blackheads and also brightens skin. You can apply the mixture to a tissue, then apply the soaked tissue to the area – like a DIY blackhead strip. This can work really well, but do be careful when peeling it off! 3. You can use a blackhead extractor tool to quickly and easily remove blackheads that are ready to come out. 4. Make a refreshing astringent out of mineral water and fresh lemon juice (about half and half ratio works well, lemon juice can be harsh so use caution). Splash or mist this onto skin to help ‘close’ pores. You can then follow with a light powder or concealer, which can be massaged in to disguise the little ‘holes’ that can be left behind! Be sure to see the tip below about cleansing thoroughly at night! 6. Cleanse thoroughly at night. Blackheads thrive when make up and oil isn’t cleansed off properly. A double cleanse is a good idea and really massage it into congested areas. 8. But it has to be the right moisturizer! The best cleansing and exfoliating action will go to waste if you’re using a moisturizer that is too oily or rich – remember it stays on your skin so has a big role to play in how clear it is. 10. Don’t forget ear blackheads! 11. Daily use of an AHA or BHA is one of the best ways to get rid of blackheads permanently, as well as clear and brighten your skin overall. 12. Consistent use of these acids is the number one “how to get rid of blackheads” tip you should take from all of these! They really can make a difference. 13. Yes, diet can affect blackheads… Notice they are a lot more visible after a few days of bad (greasy, oily, fatty) food? Experiment by cleaning up your diet for 3 days (a juice fast is a great way to do this!) and notice the difference it can make. What blackhead removal it really comes down to is consistently doing the right things. Easy! Very informative! I have blackheads and I want to treat them. So this article is very helpful for me. Thanks a lot for sharing. Blackheads are strange – they are sort of permanent in a way since they usually form in larger pores and it is almost impossible to “shrink” pores, at least beyond what is your natural size. With blackheads it’s really a matter of consistently using skin care and treatments that keep the pores clear, and prevent the blackhead refilling. Certainly you can improve your skin to where the blackheads don’t form as easily and pores are more refined. That’s what this article is about. Hope it helps! i just bought one and its amazing. this is very helpful tips..how to cure redspot any home remedies? It has home remedies and other tricks for getting rid of redness.